A unique design project to transform an old builder’s yard into a contemporary family home has specified Cembrit’s B5 corrugated sheeting as part of its development. 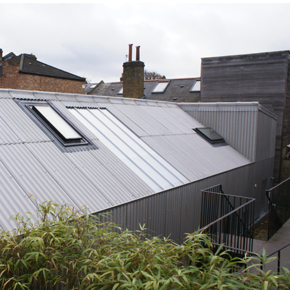 The Yard, situated in East Dulwich, is an innovative property designed to the Passivhaus standard. Its unique aesthetics and ambition led to property being filmed as part of Channel 4’s Grand Designs. The European-style home comprises bedroom and workshop wings, configured around a courtyard garden, with double-height living spaces. Traditionally used in non-residential applications, the house uses B5 corrugated sheet as its outer skin. Fibre cement offers several advantages over metal sheeting, such as being rust resistant and doesn’t create noise in the rain. Cembrit B5 was used for the roof and walls of The Yard, displaying a more modern and deeper profile than the typical 3 inch profile corrugated sheeting. Cembrit B5 was specified for its sturdy, weatherproof characteristics and aesthetics, as well as its rust and rot free properties. Cembrit B5 is available in 14 different lengths, ranging from 4’ to 10’ 6. The sheeting is approximately 40% wider than the previous 3 inch profile design, offering a better coverage per sheet. As the broader corrugations have a great water carrying capacity, it can be used to a lower pitch with smaller overlaps. For over 80 years, Cembrit has offered a wide range of fibre cement slates, corrugated sheets and rain screen cladding and building boards, operating to Environmental Management Systems (EMS) to EN14001. Many Cembrit products are manufactured under the control of ISO 9001 and British Board of Agrément. Thanks for sharing about the metal roofing sheets which is very informative and useful.